Table Tennis ticks all the boxes for those seeking to increase physical activity levels combined with stimulating the intellect, widening social interaction and broadening the sense of humour. 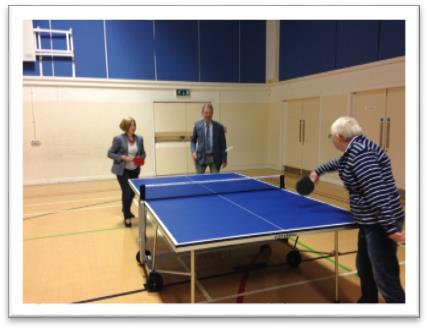 Open to all existing and new U3A members, Table Tennis definitely seems to be growing in popularity in the Beeston area. The TT-One Group has met at 10am every Monday for a couple of years or so and the TT-Two Group started meeting last year at 11-10am also every Monday. Due to the demand of ever-longer waiting lists, the new TT-Three Group was launched on Thursday 27th April at 10am. With an average £1.50 subscription to cover venue hire costs, this is a first class choice for keeping fit on a budget. Table Tennis sessions for this term will now continue through to the end of July. We are now playing every Monday morning, in two separate sessions. The original group starts at 10am and Group 2 starts at 11.10 except during school holidays, and of course Bank Holidays. Both groups play for one hour and there is no difference in the level of play or ability of players. We all enjoy the sessions, which are played in a very friendly way. If you are interested in joining us, then sorry but both groups are full at present & have a waiting list. We can add your name to the list, but it may be a longish wait. We are now playing every Monday morning, from 10am to 11am except during school holidays, and of course Bank Holidays. We all enjoy the sessions, which are played in a very friendly way. The group has proved so popular that we have started a second group. Our U3A Table Tennis Group is flourishing. The group play at the Pearson Centre for Young People on Wollaton Street in Beeston. Originally, the Centre had two tables but unfortunately one of them got damaged. This made play more difficult for the number of people attending the group. The centre decided they must buy a new table and Beeston U3A felt that they could contribute towards the cost. On September 8th, Beeston U3A Chair, Sue Blackley and Group Leader Janet Hoult met with John Wilson, Chairman of the Centre, to present a cheque for £100. An informal knock about ensued and all agreed that the new table performed very well, which was more than could be said for the players!! The Table Tennis Group meets on Monday mornings at 10.30 but only in term times, usually on the 2nd & 4th week, though sometimes moves to 3rd week to fit round school holiday periods. We play in the Pearson Centre Beeston. We are a friendly Group and we can take just a few more members as we only have 2 tables. Depending on numbers, we divide into groups of 2, 3, or 4 players. We are mainly people who haven’t played for years, and just play in a friendly way.